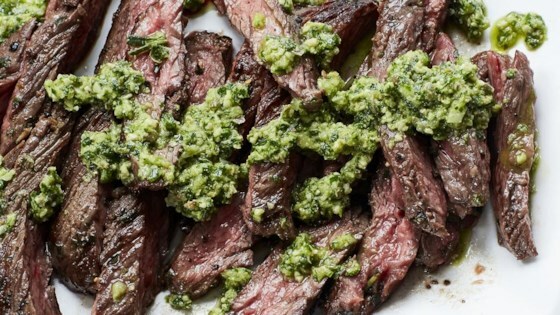 "Skirt steak with a Tuscan-inspired marinade is grilled and served with a Mediterrean-style salsa. Use your food processor to quickly prep this delicious savory dish." Process garlic, rosemary, and thyme in a mini food processor until finely chopped. Scrape down sides. Add 1/4 cup olive oil and pulse to combine. Trim steak of excess fat and cut crosswise in half or thirds for easier grilling. Put in a large zip-top plastic bag, then add garlic-herb mixture, seal, and turn to coat. Marinate at room temperature 30 to 60 minutes or chill up to 24 hours. For the salsa, process shallot and garlic in mini food processor until finely chopped. Scrape down sides. Add capers, anchovy, rosemary, thyme, parsley, vinegar, walnuts, pepper, and salt. Process until finely chopped, scraping down sides occasionally. Add 1/2 cup olive oil and process until well blended. Transfer to a bowl and let sit at room temperature 10 minutes to 1 hour. Preheat a stovetop grill pan (or an outdoor grill) to medium-high (375 degrees F to 400 degrees F). Oil pan or grate. Remove steak from marinade. Sprinkle with salt and pepper. Grill, covered if using outdoor grill, until browned with visible grill marks, 2 to 3 minutes per side for medium-rare. Transfer to a cutting board and tent with foil. Let stand 10 minutes. Slice thinly against grain and serve with salsa. I liked the ingredients but I would cut down on the olive oil! Way too oily! I think the salsa needs a kick of heat as well. Next time I would add some pepper flakes or some drops of hot sauce.